We’ve worked on enriching the Sunday experience in multiple ways: in forums about worship with guests such as a Dr. Clay Schmit, who spoke of his experiences as a Lutheran teacher at an Evangelical Seminary; and a study of Worship Matters. We’ve renewed our worship with new experiences such as an Easter Vigil, RIC Sunday and joint Korean-English service. And we’ve developed our music program: I think of the work of Lisa Curtis involving vocalists and instrumentalists of all ages, whether it’s Karl on trombone or Randy on guitar – matched with the versatility of Bettie Ross and John Magnussen, playing the new organ, the vibes or the spoons (that’s right, straight from the kitchen – you should have seen it!). At one point many churches only had access to two styles of music: “traditional” hymns with thees and thous, or “contemporary” Christian pop mostly borrowed from Evangelical traditions. Our repertoire has expanded. Now, we regularly use a folky “Lord Jesus you shall be my song” from L’arche communities, a Holy Holy from El Salvador. When we sing Amazing Grace, it may be with irish pipes or in a gospel style. 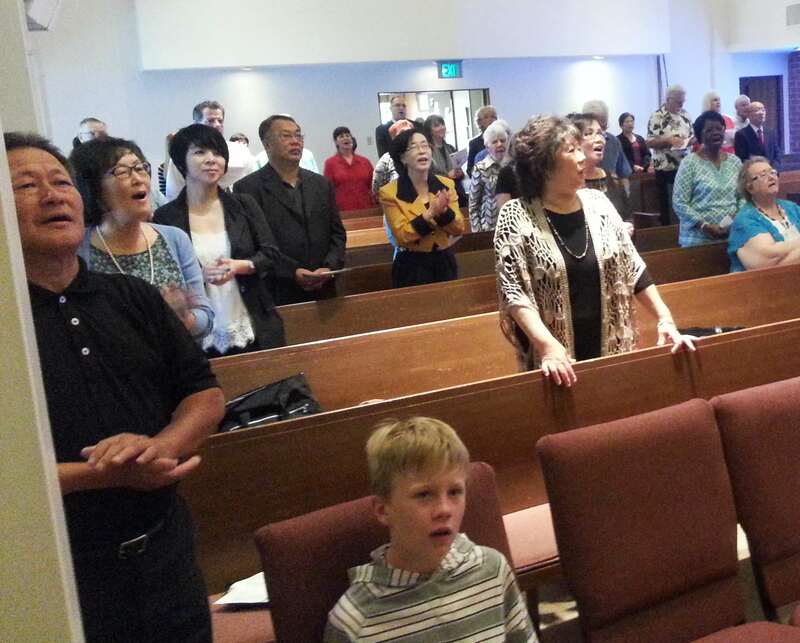 Worship is also enriched by presence of people: newcomers as well as long time members. One of the new members said at a recent dialogue that although she likes the music at both services, what’s most important to her is the presence of the community. So now, we are planning the next step forward in our Sunday experience, which we plan to start the first Sunday in February: a new schedule with one worship service in place of two. 8:30-9:30 rehearsals. 9:30-10:30 worship. 10:30-11 coffee hour. 10:45-11:30 education. How did this decision come about? For the past two Summers, we’ve gone to one 9:30 service, and many people appreciated the experience. This fall, the church council shared a proposal for a 9:30 service year round, inviting concerns and thoughts through an online survey and by hosting two dialogues. Council members Suco, Brad, David, Linda, Megan and Sue (with Lisa’s help) did a fantastic job of listening to participants and taking careful notes. Many members showed great sensitivity to the opinions and feelings of others. We had a good showing of people who currently attend both 8:30 and 10:45 worship at these dialogues. Our final poll showed that a clear majority of dialogue participants were in favor of the change. This doesn’t mean we’ll stay with one service for good. Going to the new schedule and common worship is also a way to be together as we discern God’s call for mission. At some point it may become clear that it’s time for a new alternative worship or other experience that fits contemporary Woodland Hills: Coffee house worship around tables in the fellowship hall? Contemplative evening prayer with meditation on scripture? Something else? Sanctuary repair / redesign efforts are still also underway! We have for some time been working on plans to fix the floor and windows, to make the altar area more accessible, to improve the sound system, hide the organ speakers, and generally make that space work better for how we worship. One good possibility we’ve been talking about is moving the altar down the stairs. For now – in February – we’ll use the altar where it is. The process has its own blog. You will see proposed plans soon (along the lines of what we’ve been sharing at annual meetings, etc..). This entry was posted in Pastor, Vision, Worship by officesaintluke. Bookmark the permalink.